Wherever one looked at the annual Design and Construction Week, there was a new way to make your life more efficient. Here are some highlights and photos. LAS VEGAS (AP) — Closets that freshen clothes, cooktops that won’t let pots boil over, faucets told to dispense just enough water to fill the coffee maker. Wherever one looked at the annual Design and Construction Week, there was a new way to make our lives more efficient. “We can make appliances work harder for you,” said Cara Acker, a senior brand manager for Bosch Home Appliances. So while homeowners list security cameras, video doorbells and programmable thermostats as the technology they’re most interested in, according to a survey by the National Association of Home Builders, the future is offering that and much, much more. LG Electronics, meanwhile, says its LG Styler with SmartThinQ eliminates so many allergens during a 20-minute cycle that it’s certified by the Asthma & Allergy Foundation of America. “It extends the life of clothing in between trips to cleaners, saving users money and keeping them looking their best,” said LG Styler spokeswoman Taryn Brucia. Price tag: about $2,000. The Styler is already on the market, with a new black mirror finish available later this year. The AirDresser launch date isn’t yet set. It’s a bold boast, but Bosch and Thermador, which are owned by the same parent company, say their high-end dishwashers will eliminate towel and air-drying, even on plastic. To show how it works, Acker added water to a goldfish bowl containing small white pellets of the mineral zeolite. The water was quickly absorbed, and the bowl warmed noticeably. In their high-end dishwashers, the heat generated by the moist zeolite is circulated through the tub after the final drying cycle. This “CrystalDry” feature should be available in late summer on the Bosch Benchmark and 800 Series dishwashers. The price hasn’t been released, but the technology debuted last year on the Thermador Star Sapphire dishwasher with “StarDry,” which retails for $2,800. “You have so much more range,” he said. 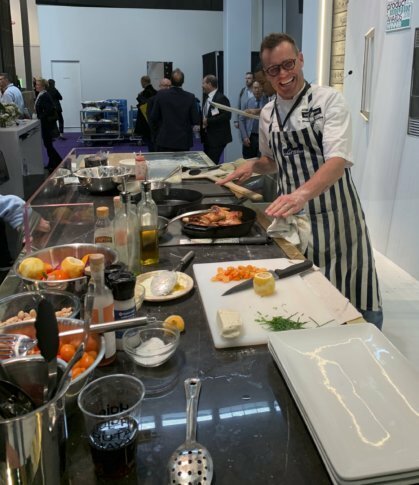 For those with nascent cooking skills, GE Appliances’ new Cafe brand offers an induction surface that uses Bluetooth to sync the burner with a smart frying pan when following a recipe through its Hestan Cue app. That pairing will adjust the pan temperature and monitor the cooking time. It retails for $2,530-$4,300. For more confident cooks, Gaggenau has a full-surface, 36-inch induction cooktop that can determine the shape, size and position of up to six pots or pans. The power level follows the pan as you move it around the cooktop, and sensors ensure that pots don’t boil over. It retails for $6,750, with a five-pan, 30-inch cooktop selling for $6,200. For those of us who can’t see straight until we’ve had our coffee, there’s now a way to measure the correct amount of water automatically. Delta’s VoiceIQ faucets lets you set up to six custom container sizes, so a voice command to “fill coffee pot” will turn the water on and off, dispensing the preset amount. It also understands requests for direct measurements, like “2 cups” or “3 quarts.” Available for the past few months on its $500 Trinsic faucet, the $150 VoiceIQ module will be sold separately starting this summer. It is designed to work on any Delta faucet with Touch2O Technology manufactured after January 2018. Another smart water product intended to reduce the headaches caused by leaking faucets and frozen pipes won an award at the show for best Smart Home Technology. The Flo by Moen hooks up to a home’s main water supply line. Sensors on the Wi-Fi-connected device monitor water flow, pressure and temperature, while artificial intelligence differentiates between normal and abnormal use. Homeowners are fed the information and alerts through a smartphone app. It retails for $500.